He was the founder of an American industry and an original innovator of modern business communication. Born in 1888 in a small Indiana town, he was raised as a single child by his mother who was widowed in 1892 when he was only four years old. 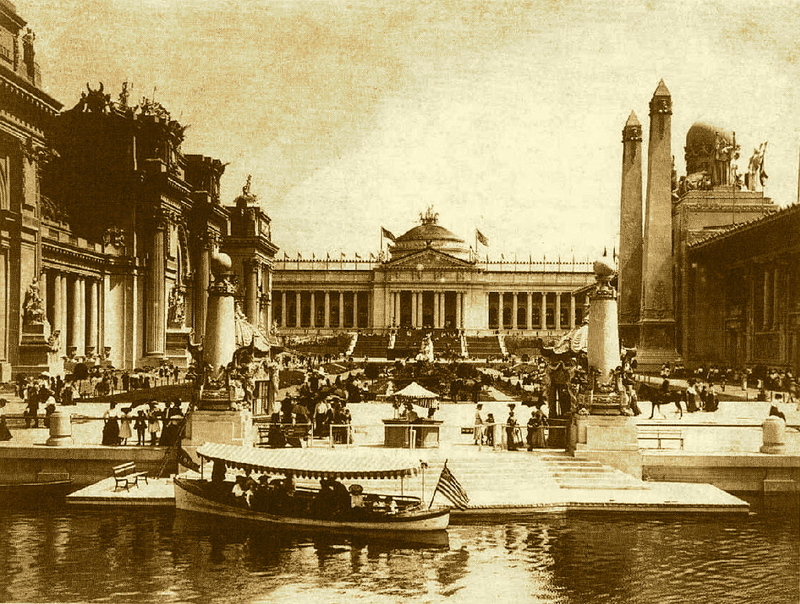 In 1904, he traveled to the St. Louis World’s Fair. He got married in 1909 and moved to a new town in 1910 with his new wife. There he started a family and a new industry centered on business advertising in telephone directories, those growing number of businesses with telephones that wanted customers to call them. The concept was not much more complicated than this. It was one of the reasons for his incredible success in life. A simple, unique concept, so different it seems than all the “derivative” concepts, so much like one similar film after another at our movie theaters today. A simple concept in the vision of one of the century’s greatest salesmen. It showed many the power of entrepreneurship in America as it entered the new century with hopes so high. He perfected the art of salesmanship but more than this he mastered the art of faith and the transmittal of this faith in life. When he was 16 years old, he visited the World’s Fair in St. Louis and saw the above Government Building Exhibit at the fair. It was perhaps the main sight he saw when he saw all of this at 16 with his widowed mother. So far, the outline behind this unusual biography is over 27,000 words alone. We’ve only attempted to match events to dates. Many of these are from the local historical director. He has given us unprecedented access to the daily records of the small town in Indiana where he grew up. Records of the entrepreneur are also obtained through the county librarian who provides very important information on his early years. Through research over the Internet and through a nearby library, the author also adds into the time period important world and national events in addition to the incredible daily events we receive from the county historian and librarian. Before, this period had been no more than glossed over no one who really knew much about it. Or seemed to want to even know about it. Also through certain, members of the business leaders family. His grandsons. They were the only ones alive who still knew the famous man from a personal perspective. They knew him personally. Not through media of any sort. But through that rare personal connection to the famous man. There was an obligation, it seemed, to have one or more of these grandsons of the great man come forward with their memories and stories of the man. Come into this story so to speak. As well as all who personally members the man. This group seems an important author/narrator story support cast. All those remember the subject of this story and choose to become part of this memory project. Or historical research people like the county historian and country librarian. He was influenced for 22 years by what happened in this little town. And perhaps it is important to know what really happened in this town and, at the same time, perhaps place us within the perspective of this young boy by creating a world by recreating it in media and events and people and places. The songs he heard. The books he read. The mentors he had. The father he always searched for? The place he spent the first part of his life. Where he was born and grew up. Where he first tested his ideas about business. Where he helped to keep the family out of the poor house. His selling radishes and laundry services and his widowed mother working as a distributor of products for that new concept called a drug store. There are reports that strange substances like cocaine in these early “medicines.” She also worked as a nurse and was a dressmaker. Their combined incomes got the two of them through these rough years. Even through the depression of 1993. Today, this little town place where he grew up in is more mysterious than that missing flight ten thousand miles away. Everyone says the same thing about it over and over. Quoting someone who quoted someone else who proclaimed to know something but really knew nothing. The outline so far attempts to do this. But no more than an outline of facts about what happened in the world of the young man. Maybe by creating this external world, the internal man might be known a little better? That and creative speculation of what someone might have been. From as close as you could get to a personal perspective from those who had a personal perspective on the subject of the biography. This seems the ultimate goal of a new type of biography.